Catch and release, like new – I bought this on BPL and never used it. Size is 6 foot long, regular width; grey color, 900 fill. Includes straps and cord, silnylon stuff sack. Stored loosely in closet. Weighs about 28 oz. 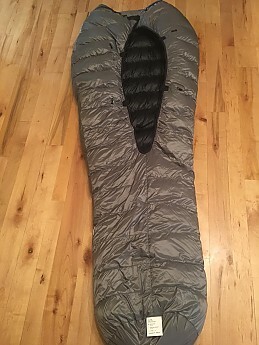 I have one of these down in AZ for winter backpacking and it is wicked warm and cozy comfy. Price new is $580 with a minimum two week wait time. i am in Australia(Sydney) are you willing to ship to me? I will look into the costs; however, due to the complications of shipping internationally, it would cost you $480 + the actual cost of shipping. Total cost would be $600 for insured Priority shipping - 6-10 day arrival. can I give you a counter offer of $550 including shipping and insurance. i can make instant PayPal payment. its definitely all complete with be sleeping pad adjustments? Upon further investigation, I've found that PayPal charges a 2.5% foreign currency fee and is notorious for giving bad exchange rates - my $600 offer did not take the fees into account, only USPS international priority shipping with insurance. With that in mind, it is just too complicated for me to calculate what I think is a fair price for the item and my time for an international shipment (filling out customs forms, going to post office, etc. ), so I have decided not to pursue this sale any further and withdraw my original $600 offer. My apologies, but as a private individual I am not set up to deal with international shipping. Have you tried contacting Katabatic directly? inpay for the conversion not you.